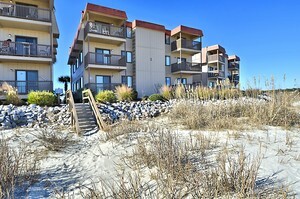 Located on the inlet in Cherry Grove Beach, these 2 bedroom condos offer an extradordinarily unique view of both the ocean and the inlet. Enjoy the breathtaking sights of waves crashing along the Atlantic Ocean as well as the serenity of the Inlet. 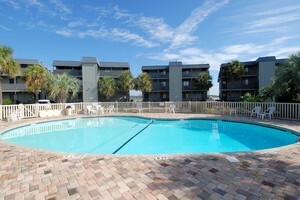 This gated community offers many unique featured to add to the enjoyment of your vacation, such as tennis courts, an outdoor pool, a grill area, and screened in balconies. As a traditional low-rise condo property, it is very easy to get up and down the wide staircases. Not only do you get to enjoy all the wonders of the ocean at this property, but there is also a lot to explore in the salt water marsh for the whole family. Whether you rent a kayak to explore the meandering creeks, or hire a fishing guide to help you get some fresh catch, there are plenty of activities to keep everyone entertained. Stop by the Condo-World Sales office or call us today to learn about the real estate opportunities available at Inlet Pointe!